Take a bit of mexican music, a lot of yells and shouts, a rattle snake, 2 bottles of tequila, a lot of fast rock'n'roll guitar and bass, an old style drum machine and a cactus. Throw it all in a blender and press full speed for a few minutes. Voila, there you have it: Hola Ghost in your face. Peter Sandorff (ex-Nekromantix) and Jeppe B. Jessen and their very best friend Ghost-707 have created this weird but very effective cocktail that manages to rock a lot more than you perhaps might suspect. Also joining in on keyboards is Mia Olsen. The new 11 track cd is pretty much a reproduction of their brilliant live set. 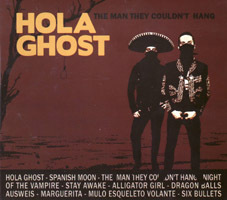 It includes the wellknown song Night Of The Vampire but also live favourites Hola Ghost and The Man They Couldn't Hang. The killer track Stay Awake includes a Roland 707 drum solo, that'll make you drop your jaw. Check it out if you're not afraid of ghosts! The question is if there's enough drum solos out there? Is there enough drum solos in rock'n'roll!? Hell No!!! Hola Ghost!!! Highly recommended on 180g vinyl. It sounds awesome! !